Back in April when we caught the first look of the HTC Sensation 4G, we were thrilled by its design and complete feature set. It was obvious that HTC had put a massive effort into developing it. It is December 2011 now and we’re talking HTC Vivid. The phone has practically the same specs and functionality, save for the bumps in the memory and screen departments, along with its LTE radio. HTC have raised the bar for themselves with their previous dual-core Android smartphones. The Vivid is nicely spec'd and it's also nicely priced although the materials that went in it are not as premium as we've come to see from HTC. Currently, the HTC Vivid sells for $99.99 with a two-year contract. If anything, the device is priced well for a dual-core Android smartphone, not to mention the LTE connectivity. Let’s take a quick look at its alternatives now. If you are an HTC fan, the Sensation 4G, Amaze 4G, or EVO 3D will all give you better value for your money unless you are into LTE specifically. All three devices will offer you a significantly better build quality and looks to go with the exact same functionality. 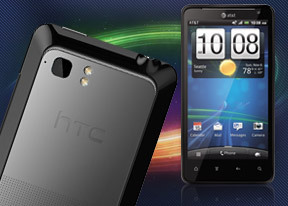 The HTC Sensation 4G sells for $ 199.99, while the Amaze 4G and EVO 3D will set you back $239.99 and $99.99 respectively. You can always shop around at an authorized reseller and get a much better price than what the carriers are asking for them – especially if you are signing a new contract. If you must have LTE on board, you can also take a look at the Verizon's HTC Rezound. The company’s flagship costs $299.99, but offers a killer retail package in addition to its HD screen and LTE flavor. You can also shop around for it and find a better price. Amazon Wireless for example, was selling it for a penny not so long ago. Within AT&T’s own LTE lineup, you will find the Samsung Galaxy S II Skyrocket and LG Nitro HD as options. Both devices cost only $50 more than the HTC Vivid and offer superior hardware. The Skyrocket has the highly revered 4.5” Super AMOLED Plus screen, while the Nitro LG packs an award winning AH-IPS unit with HD resolution, designed with the purpose of besting the former. Both displays will blow HTC’s LCD unit out of the water. There are plenty of other options and they all do not bode well for the fate of the HTC Vivid. It's obviously priced below the high-enders but its build quality is not as good as it should have been. And the cut-throat competition these days doesn't leave much room for compromise. It's still a quite capable droid with ample screen estate and a nice camera, so it's worth a shot if you are ok with its looks.